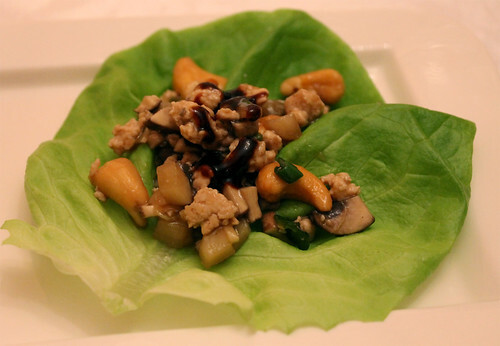 For the lettuce wraps, I marinated some ground turkey breast meat with a little soy sauce, sugar, shao xing, ground pepper, sesame oil, and cornstarch. Then the marinated meat was stir-fried with chopped mushrooms, water chestnuts, green onions, garlic, ginger, soy sauce and oyster sauce. Roasted cashews were thrown in towards the end for an added crunch. It was served on a piece of butter (Boston Bibb) lettuce with a sprinkle of fried shallots and a drizzle of hoisin sauce. 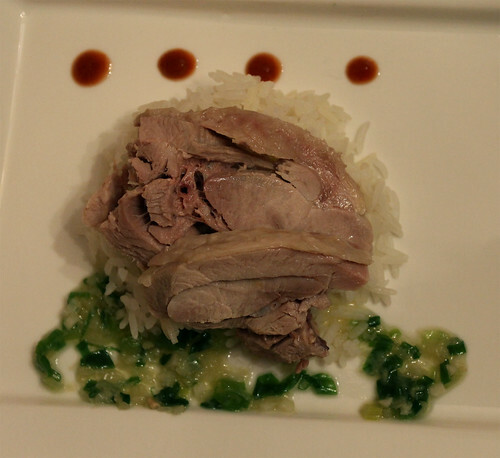 The upper turkey thighs were used for the Hainese turkey. They were poached in a flavourful stock of star anise, whole peppercorns, garlic, ginger and green onions. The water and the stock ingredients were first brought to a boil before the turkey thighs were added. The water was then brought to a boil again before the heat was shut off and the thighs were left to hang out in the hot bath for about an hour and a half. Once ready, the thighs were dunk into ice cold water to stop the cooking process and to cool down the meat. The thighs were then deboned, sliced, and served with coconut rice, ginger-scallion sauce, chilli sauce, and poached choy sum. It wouldn't be a proper tasting menu without some kind of palate cleanser! This course was mostly just for kicks, but in keeping with the Christmas theme, I wanted to use cranberries. Hence the cranberry sorbet. The tartness of the cranberries and citrus really helps clean up all the previous flavours you were tasting. Plus its lightness and coldness is refreshing and reawakens your appetite for the second half of the meal. 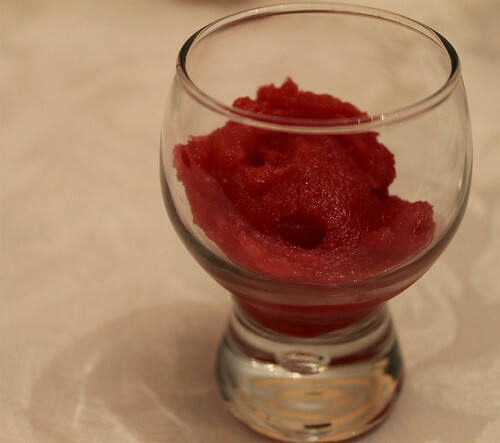 I referred to this recipe from the November 2003 issue of Gourmet for the cranberry sorbet. I named this course as such because the plate represents classic comfort food. It's the kind of stuff that you crave on a cold winter's day, or wish your mom could make for you. I wanted this course to evoke the sensation of a warm embrace from home. 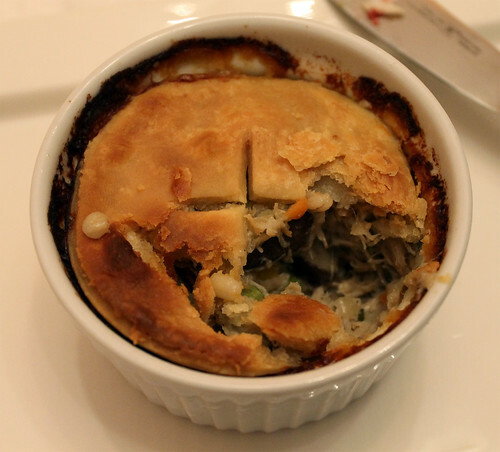 Pot pie is such a standard comfort food. The most common version is chicken, so it's no surprise that its cousin the turkey would make for an equally delicious pot pie. I actually shredded the meat from the wings and carcass that were used for the consomme and reserved it for the pot pie, but you can just as easily poach a turkey breast or use leftover turkey meat for this recipe. On the other side of the plate was a stuffed turkey breast, rolled and wrapped in prosciutto. 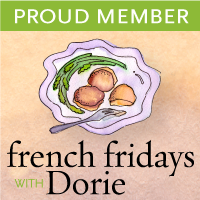 This was a little more fancier than the pot pie, but something that mom would might have made for a fancy Sunday dinner or family holiday feast. The stuffing included porcini mushrooms, prosciutto, shallots, breadcrumbs, herbs, and cranberries. The turkey breast was wrapped in prosciutto to give it that fat and moisture it needed while it roasted, as I had reserved the skin for the tacos (you can easily replace the prosciutto with the turkey skin if you want). 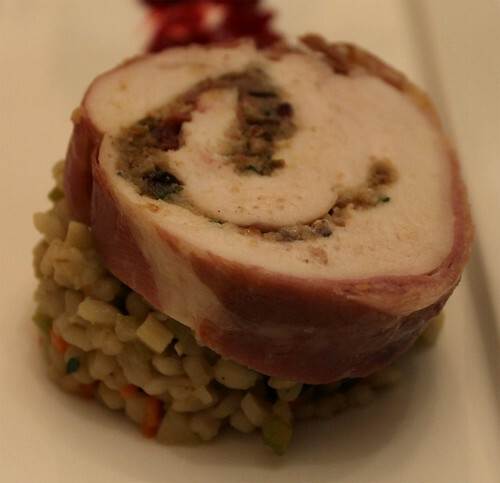 The finished roulade was sliced and served over a barley risotto with winter vegetables and a cranberry-orange chutney. Last but not least, we finally arrived at dessert, the second of the two courses that did not contain any turkey in it. I recently tested a few recipes from the Mourad: New Moroccan cookbook and fell in love with the dessert I had made—a chocolate-star anise cremeux. It was rich and silky and oh-so-chocolately with a subtle licorice hint. All in all, the cremeux rocked my world and I knew that, no matter what, I had to include this on my Christmas menu. I didn't want to serve a plain cup of cremeux though, and after much thought as to how I wanted to plate this, I came across another recipe in Mourad when I was flipping through the book for more inspiration. There was a recipe for a Walnut Brittle Crumble, and I thought that would pair nicely with the cremeux, both taste-wise and texturally. For the final presentation, the cremeux was served in a shot glass, while I brushed melted chocolate across the plate and sprinkled a mound of the walnut brittle crumble on the opposite side of the shot glass. 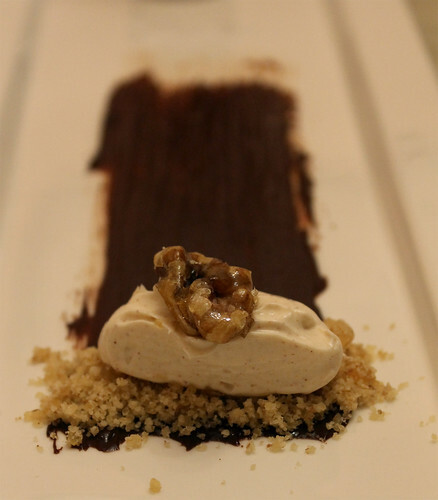 The crumble was topped with a dollop of cinnamon creme fraiche and a broken piece of the walnut brittle, left whole. Maldon sea salt was sprinkled on top of the cremeux and on the dish to create that sweet-salty balance. I am so thrilled that this Christmas dinner turned out so well. There were only two possibilities of how this tasting menu could have ended—we could all be full and content and taking a food-induced nap, or it could be a disaster and we would be eating peanut butter and jam sandwiches for our Christmas dinner. Thankfully it was the former. And despite all the work that went into creating the menu, I can't beat seeing the contented faces of my family at the end of meal. It brings me such joy to feed others, and I couldn't have asked for anything more. What I'm most impressed about with myself (besides actually pulling this menu off)? The fact that dinner was wrapped up in less than two and a half hours. I was worried I'd be starving my family throughout the night as they had to wait endless for their next course, but with careful planning and a great kitchen hand in my mom, I was able to dish out the multiple courses in a timely fashion. So wraps up my holiday cooking, from the weeks of the baking, to the weeks of planning and the two-day cooking marathon that lead up to this meal. And now I have a whole year to prepare and plan for the next Christmas meal, as I wonder how I'll ever top this one? Restaurant Brugge January 6, 2012 at 2:18 a.m.